Decided to combine all my dogs' life story threads into one since we have a new addition now and it is too crazy to have 3 separate threads for each dog. Here are links to Maluko and Koji's old threads. I will be keeping all updates here from now on. 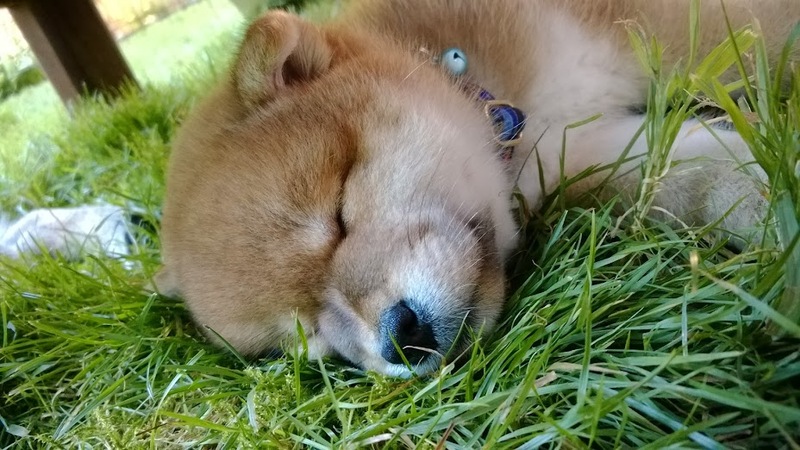 Got a new addition to my pack - Introducing Taiyo (previously known as "Tony"), who just joined Maluko and Koji, 2 weeks ago. Taiyo is 7 months old today and has already started Agility foundation classes the week I got him. Taiyo means "sun" in Japanese and is his call name. His registered name is Masakado Rising Sun. 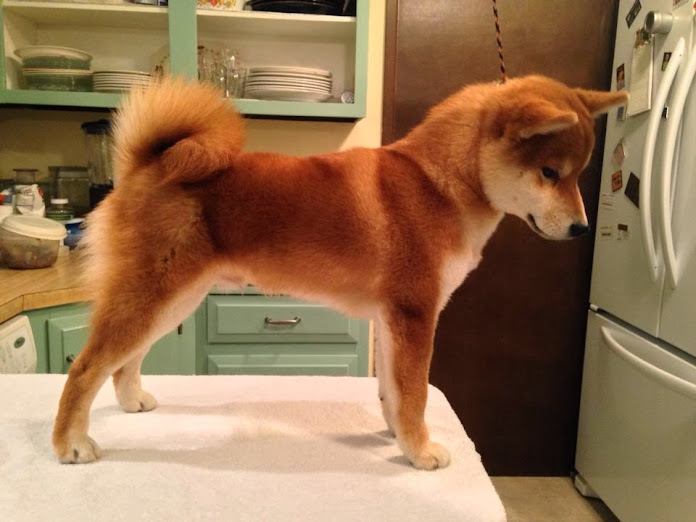 He was bred by @lindsayt and Leslie Ann Engen (San Jo Shiba) and is related to both Maluko and Koji (he is Koji's cousin). Koji is doing really well in Agility and Barn Hunt. He also dabbles in Competition Obedience a couple weeks ago and earned his Companion Dog (CD) title with a score of 193 and a 2nd placement at the Puyallup show 2 weekends ago. We just got back from Rose City Classic in Portland, OR and Koji got 6 Qs out of his 8 runs over 3 days of showing, including 1 Triple Qs and 1 Double Qs. This is one of the 3 chair back covers that I got for Christmas. The big ribbon on the right was a pleasant surprise. Koji earned the High in Trial for the Non-Sporting group at the Dobie Trial in November 2013 and a friend picked up the ribbon for us as we were playing Nosework when the ribbon was handed out the next day. Old dogs can definitely learn new tricks. Maluko (8 years old) came to me at almost 5 years old as my first dog and has made so much progress in the past 3.5 years that we have been together. I never thought we would compete in anything, but it was her that I took to our first Rally trial. She earned her Rally Advanced Excellent (RAE) title in just a year. She then got her Nosework Level 1 (NW1) title and made it to the Master level in AKC Agility. At a trial 2 weeks ago, she got her first 2 Master Standard Qs with some MACH (Master Agility Championship) points. Here is my sweet girl's Standard run on Friday that weekend. She may not be a speed demon, but the progress she made is just amazing. This is a dog that had no formal training for the first 4-5 years of her life and who used to walk the agility course, just to amuse me, and now she is actually running. I am very proud of her and look forward to more agility fun with her in the future. Finally, this is a rug that I got a couple weeks ago.. Thought it was cute and had the 2 Shibas did the down/stay while I snapped the shot. Amazing.! I can wait to teach mine that. When did you start training? Aw! Look at Maluko go! She was concentrating on those weaves, huh? I love seeing her go, what a good girl! What are you referring to? "Agility"? I treat every interactions with my dogs part of training, so technically, their training starts from the day I got them, regardless of their age. I may not be teaching them any specific command, but I am reinforcing behaviors I want (focus/attention/calm when not asking to work etc/impulse control). Life is full of choices and I am teaching them to choose behaviors I want. Maluko has made so much progress that is beyond my wildest imagination. This dog used to be nervous/shaking when I first took her home and walked her in our quiet neighborhood. She was not interested in food/playing, but now she is a food hound and has her funny playful moments. It is so rewarding to see the changes in Maluko and her quality of life and exposure to all the stuff the world has to offer. Love your updates hope Taiyo does well. I really, really like that pic of Maluko! and Taiyo really IS a sunny boy. What a nice shiba family you have! Koji earned his Barn Hunt Master (RATM) title on Sunday with a first placement and a High In Trial Master on Saturday. 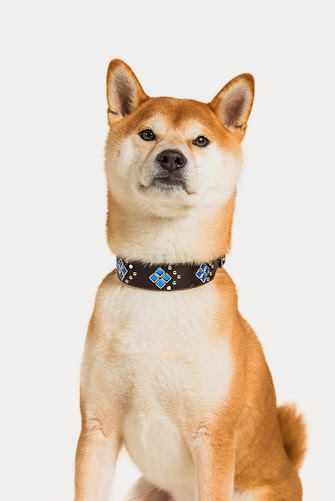 He is the first Shiba that earned such title and there are only a handful of dogs in the country that has the RATM title. I am very proud of my boy and how well we played together as a team. He was happy and on task hunting and stayed quietly in the car waiting for me all day while I was busy fulfilling my judging duties this weekend. It was very rewarding to see many new teams having a blast with their dogs, but I was dead tired. 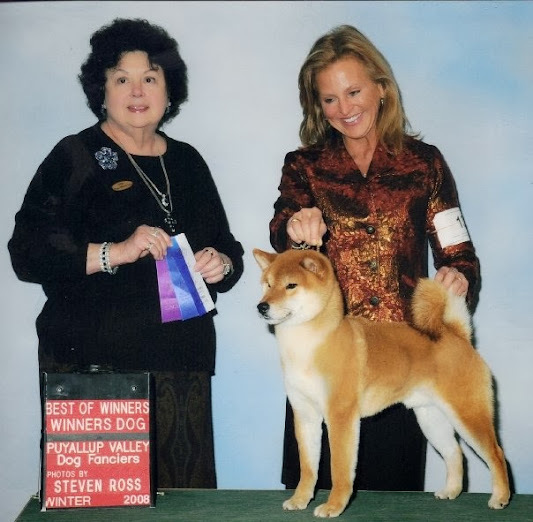 Koji held up well and worked very nicely with me when we were in the ring hunting. Koji also got Double Qs on Friday at the agility trial in Ridgefield with a 2nd placement in Master Standard and a 4th in Jumper. Having a great time playing with my Shibas! Koji's new bling to celebrate his RATM. Taiyo turned 9-month-old on 3/20. Check out the short clip from his 2nd swimming lesson. A very brave and inquisitive puppy he is, learning very quickly that being wet and in water is not gonna kill him and can calm down to not kick frantically. He was able to not just swim, but retrieve the toy in water. Love my monkey boy! Koji finished his MACH2 (Master Agility Champion 2) today under judge Lavonda Herring at the Spokane Dog Training Club trial in Nile Mile Falls, WA. 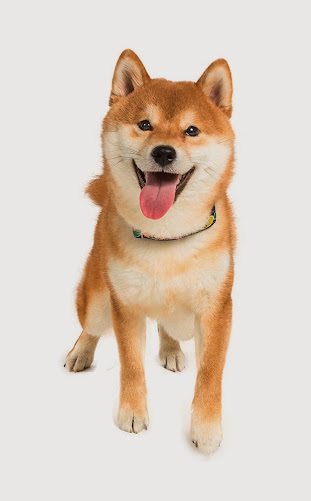 He is the 4th Shiba to earn a MACH2. The Banjo Boy also got his 10th QQQ and earned his TQX (Triple Q Excellent) title at today's trial. 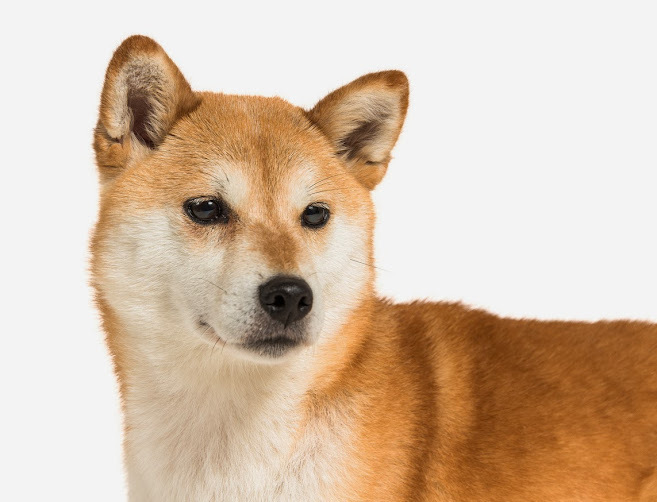 Many were surprised to see a Shiba running at an agility trial. Let alone one that finished his MACH2! This is Koji's MACH 2 run from the JWW class. We only needed 8 points for the title and we got 12 from this run. It was nice and smooth and I am very proud of my boy! Koji got 5 Qs out of his 7 runs from the weekend. The 2 NQs were totally my handling errors and he always tries his best. This boy has a heart of gold for his mom and for that, I am really grateful to have him as my first Agility partner. Congratulations! Way to go, Koji! Good job Koji and Sandra! You are an amazing team.